I'm a big fan of alliteration. What can I say, I'm a grammar nerd. 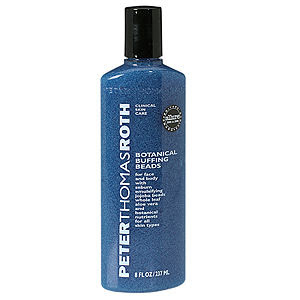 So I loved Peter Thomas Roth Botanical Buffing Beads before I ever even tried it! Luckily, the name did not disappoint. This delightful blue gel is chock-full of miniature jojoba beads that do exactly what the name implies. They buff, shine, exfoliate, scrub and otherwise slough your skin until it's super-duper smooth. Jojoba oil and aloe vera also work to soften skin. I've been using this on my body only for the last week and have noticed a huge difference, especially on rough patches like my elbows and knees. They sure aren't rough anymore! And if you are interested in using it on your face? It works to unclog pores, so you can say adios to those unsightly whiteheads and blackheads. Not to mention the scent is fantastic. It's light and airy but with a hint of mint -- so refreshing early in the morning. Peter Thomas Roth Botanical Buffing Beads retails for $36 at beauty.com. this is def going on my wishlist!